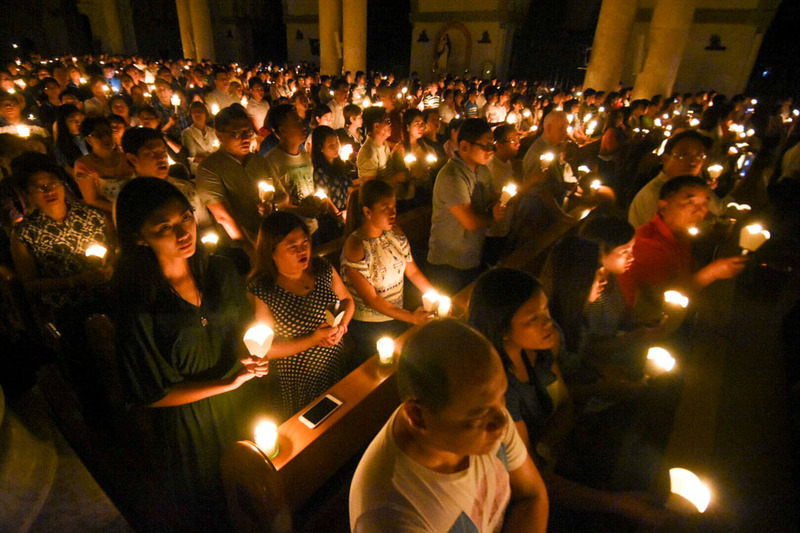 On 1 March, the Diocese of Rome, clarified that the Easter Triduum, and especially the Easter Vigil, are to be celebrated in parishes; Not in chapels, oratories, or congregations of clerics and religious. Such a rule has been in force since the time of the Consillium (apparently without much effect), but it is making a splash in Rome, nonetheless, as favorite Triduum locations are clarifying the communities will be in parishes this year. Next Post:Is a shared ecclesiology across the generations possible? I wonder what triggered this. Concern over the Neo-Catechumenal Way, which has a separate vigil? Do they need a separate one? They don’t need their own separate Vigil, but they insist on having one. This has been a cause of division and discord in many parishes in the past decades. I don’t know of any particular ’causes’, except there are many seminaries and religious orders that celebrate the Triduum ‘in house’. Just FYI the document did seem to me on first reading as if it were addressing the Neocatechumenal Way in particular. Although it does mention that if there are too many people to fit into the parish church for one vigil a second vigil can be organized (believe it or not, this is an issue in some of the parishes in Rome that have hundreds of people involved in the Neocatechumenal Way). It’s hard to say, at least for non-Italian readers to do much more than accept the poster’s general summary of this at face value. It does make me wonder about, for example, cloistered nuns, who it would seem would be limited to conventual celebration of the Divine Office. So, it’s a post that doesn’t necessarily shed any particular illumination that readers can engage. Cloistered communities (as well as hospitals and prisons) are allowed to continue having their own celebrations, per the top of page 6. How many colonels work at the Pentagon? Everyone will have a favorite “how many” question. For the purposes of this post, the well known “how many churches are there in Rome?” will come easily to mind. One of Rome’s most splendid churches is Sant’ Andrea della Valle on the Corso Vittorio Emmanuele, very near Piazza Navona. Its dome is the second largest after St. Peter’s. Walking in the direction of St. Peter’s, about six blocks farther on, but on the other side of the street, is another grand church, Santa Maria in Vallicella (Chiesa Nuova). Neither of these notable churches is a parish church. They are oratories, devotional churches. In addition to the many devotional churches, there are chapels, often large, in seminaries, national colleges, generalates. In its communication of 1 March, the diocese of Rome is simply TRYING, once again, to underscore the privileged place of the parish for the celebration of the Triduum, especially the Easter Vigil. Religious and seminarians should celebrate in the local parish. An exception is made for cloistered nuns. Of course, this problem isn’t limited to the Eternal City, but it takes on outsized proportions in a city where the nearest church is across the street. Yes. I didn’t have time to translate the documents, and figured in the world of Google Translate, such and exercise would be redundant. 1. The parish, with the bishop, is the embodiment of the ‘Church’ in worship and therefore has pride of place as the expression of the Church, especially in the paschal mysteries. I like to think this has something to do with sacramental initiation during the Vigil. 2. The document clearly states that ‘religious life’ is a service to the Church. It implies that religious congregations should be going out in service, rather than expecting the laity should come to them. A type of ecclesial short-circuiting or back-flow. 3. There seems to be a pastoral concern that with the number of parishes, the work load of parish priests, and perhaps the lack of vocations (? ), religious orders can be a practical presence in the ministry of parishes, especially during the Triduum. The problem with that document as linked for Google Translate is it’s an image PDF the text of which can’t readily be copied and pasted into GT…so unless a reader has OCR transcription or manually transcribes it, it will remain in the Italian original…. It’s interesting in light of Mark Francis’s Amen Corner in the September 2018 issue of Worship, “A New Look at the Parochial Principle.” He argues that a variety of associations can foster faith and evangelization (and have done so through the centuries) and that the emphasis on parish is perhaps not the way to go for the future. Alas, many examples depend on religious orders, and I don’t see that as a widespread fashion again soon. The movements are a big deal in Europe, moreso than in the United States; perhaps that is a counterbalance to the parishes. Seems the Diocese of Rome is doubling down on the parish principle. If a religious house or community have a paschal candle, holy water, etc, when does that get brought in to the Community? Is the problem with the initiation rites being celebrated in the religious community’s place of worship when they should be parish based? Can an Easter Vigil be held in the oratorios and particular chapels without the Sacraments of Initiation? A related issue is the one where a parish may have, say, three churches, but only one priest to serve them.. There will necessarily be an Easter Vigil in only one of the three churches, so how do the other two acquire their paschal candle? One parish that I know of would bless three candles at the Vigil but only light one of them, the one for the church where the service was being held. At the end of the Vigil, the other two candles would be lit and solemnly processed out of the church. The following morning, they would be processed, lit, into the other two churches at the beginning of Easter Sunday Mass in those churches. This was a tangible way of binding the three church communities together as one parish. It would appear that the same gesture of community could be extended to enclosed communities of nuns. Other non-enclosed religious communities, seminaries, etc, would be expected not only to celebrate the Vigil with their local parish but also join them for regular parish Masses, baptisms, funerals, etc. @ Ed Nash: I don’t have particular information, and the instruction does not address all your questions, but: (1) the letter says “follow instructions in liturgical books” for options. (2) Perhaps Easter morning the blessing of the font with sprinkling (The blessing of the Paschal Candle for communities without a vigil is an unknown (see Inwood, below perhaps). (3) The letter seems to be more concerned with the parish as a preeminent ecclesial symbol, more than an order celebrating initiation. (4) The letter states that only cloistered communities may celebrate the Triduum, and they must do so fully. Not in parts, unless there is some serious impediment to doing so. From my reading of the rubrics, there has been no “blessing of the candle” since the 1970 Missal (of Paul VI) was published. In the 1962 Missal, the fire was blessed, the candle was inscribed, the candle was lighted (with the text “May the light of Christ …”, and then (rubric no. 8) “the celebrant blesses the lighted candle, saying: … Almighty God, pour out your abundant blessing upon this lighted candle. …” The previous missal had a subtitle “De Benedictione Cerei Paschalis” before the inscription of the candle. The current missal has the subtitle “The Blessing of the Fire and the Preparation of the Candle.” In the 1970 (and current) Missal, there is no prayer of blessing of the candle (lit or not) — there is only a blessing of the fire and a lighting of the candle. Thus, I see no reason to have any special “blessing” of a paschal candle in churches in which the Vigil was not celebrated, since the candle is not explicitly “blessed” in the current texts of the Vigil. *Rubrically*, you’re quite right, no rite is indicated as accomplishing a blessing of the candle (i.e., nothing is labeled or described as a blessing). Just to extend the historical view a bit further, the Exsultet was for centuries considered to effect the blessing of the candle (by the *deacon*). The 1955 reform displaced the “blessing” from the Exsultet to what had been the blessing of the grains of incense (it added the word “cereum” and updated the demonstrative so that “may the lavish outpouring of your blessing come upon this incense” became “…come upon this lighted candle”). So the layer of rubrical development represented by 1962 MR was a short blip in the longer arc of ritual history: expansive rite of blessing by the deacon => short blessing prayer by the priest => no blessing at all. I can’t verify from the editiones typicae, but at the stage of development represented by our old Sacramentary even the “preparation” of the candle (inscribing symbols and inserting incense) was optional. The case might seem closed. *And yet*, for all this, we find 1988’s Paschalis solemnitatis asserting that the candle “is blessed with the signs and words prescribed in the Missal or by the Conference of Bishops” (82). How so? In fairness, I don’t see offhand any declarative or imperative forms in the pre-1955 Exsultet which clearly mark a blessing. There is indication that the Church offers evening sacrifice in this “solemn offering” of the Candle “hallowed to the honor of your name,” but no verbal sign of precisely when the hallowing occurred. So if this implicit language, combined with the insertion of incense and lighting, effected the “blessing” before ’55, I can’t fault the CDW for following the ’55 labeling by interpreting the same signs (albeit with different words, and pre-Exsultet) to perform that work still. This complicates the USCCB guidance for multiple Paschal candles, since candles “prepared in advance” have a very tenuous claim to have been “blessed alongside the main candle” at the Vigil. I thought the ancient form of the Exsultet was an anaphora, with the wax of the candle being the subject “sacrifice”. Interesting, then, that the Holy See website has a Vigil scheduled for the Capella Papale at the Vatican. (Granted it IS the grandest capella in the world.) Wouldn’t these regulations require it to be held at the parish church of St Ann? Of course the full spirit of these regulations would seem to point to the bishop presiding at the Vigil at the cathedral, rather than his chapel, which would draw the pilgrims to the Lateran, leaving the pastor and people of St Ann’s to celebrate in peace. Well, the one stational Triduum liturgy at the Lateran has not been celebrated there by this Pope, and it doesn’t look like it will be this year, either. Just an observation. Now for something radical, one might consider that as things now stand (pun intended) feet can be washed outside liturgical or ritual constraints. Apparently St. Peter’s is considered a parish in the Diocese of Rome, so perhaps this is how they think of a Vatican vigil/Pasqua? I checked the Diocese of Rome website and neither St Peter nor St Ann appear on the list of parishes. In fact the territory of Vatican City appears as an empty space surrounded by other deaneries. In Rome but not of Rome perhaps? Vatican City is not part of the diocese of Rome. The archpriest of St. Peter’s Basilica, at present Cardinal Angelo Comastri, serves as the pope’s vicar general for Vatican City. “Capella papale” signifies that the pope will celebrate Mass with cardinals and bishops present in Rome. It is the highest form of papal ceremonial. I am a pastor in an inner city area where there are three religious communities close by. They like having a priest for their community services, yet several priests serve multiple parishes and various ethnic groups in their own languages. There are lots of demands. I agree with the 3rd point of Oblate Hadley that “religious orders can be a practical presence in the ministry of parishes, especially during the Triduum.” His point goes beyond the Triduum. The communities often offer programs or ministries that are detached from or conflict with the parishes. I invited one community to help with an evangelization process, but they declined my invitation even to listen to my proposal. There are lots of issues here. 1) As mentioned above: providing more clerics to the parishes at a time when chronic cleric labor shortage is stretched to exhaustion. 2) Directing money contributions to the parishes from the non-parish places of worship.